Now is the time to bring your restaurant up to date by using the technology already in your guest's hands. 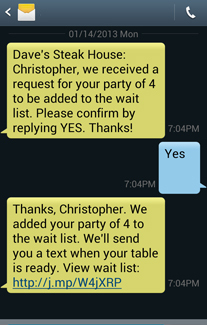 Seat By Text is a revolutionary text message based system that provides an easy, efficient and completely paperless management of your restaurant's wait list. 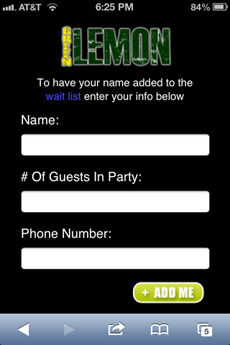 Guests can view the wait list in the palm of their hands. No more interrupting the hostess for an update. 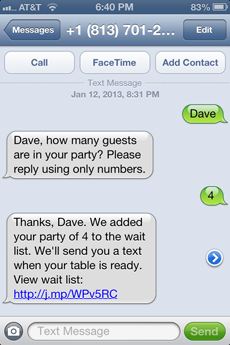 Guests receive text messages and web-based notifications when their table is ready. No need to keep those expensive, unsanitary pager systems. 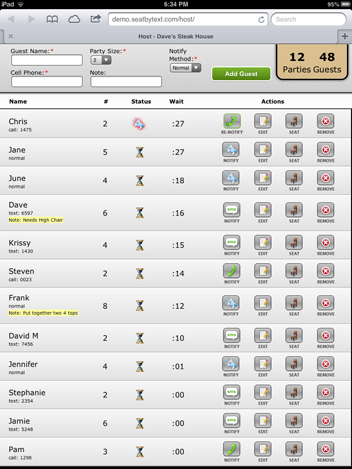 Multiple devices can be used to maintain the guest list and all devices update instantly when changes are made. Back of house monitor system that provides up to the second front of house data to your kitchen. Web-based with no apps to download. Works on all Smartphones so your guests are more likely to use it. Complete access to data and analytics so you can manage your staffing needs more efficiently. See the impact we can make in your restaurant. Call or email today for a free demonstration. Seat By Text brings technology to where you need it most. It makes customer service and monitoring service levels easy, and because it is based on a simple, internet application, there is no expensive equipment or training necessary. Just start using it, and get all the benefits. 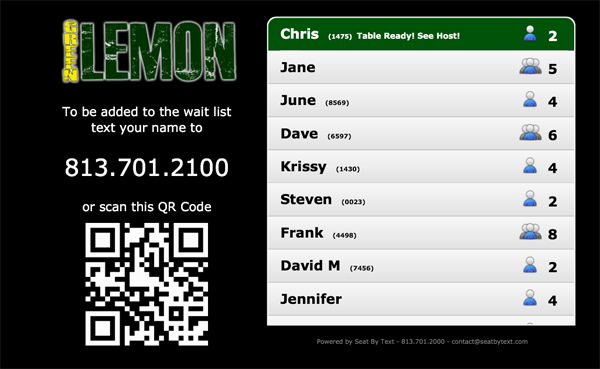 The Seat by Text interface is easy to use and will let you access your real-time wait list from multiple devices around the restaurant. It is intuitive, reliable and responsive. 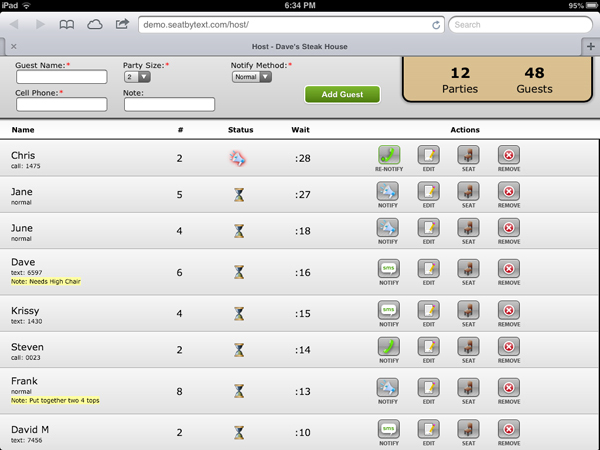 You can now notify parties from the floor in addition to the host stand. 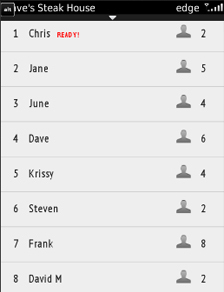 It also utilizes visual cues and wait list tools to help you run your restaurant better. Seat by Text has a text message paging system that eliminates restaurant pager loss. 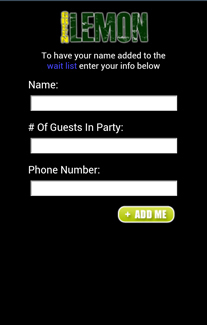 The text message paging also delivers a customized link to the waitlist along with other details to your guest. If your guest prefers, we also provide a custom recorded voice message informing the guest that their table is ready. These voice and text messages can be customized according to your needs. 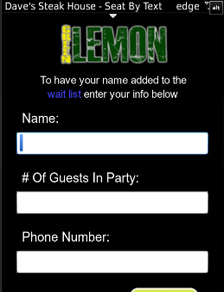 Seat by Text provides your guests with a pager, mobile version of the waitlist, and instant access to your hostess/managers all on a simple web based app. But don't forget about the other half of the restaurant. Seat By Text also provides up to the second data to your kitchen so they can anticipate guest needs and work more efficiently. 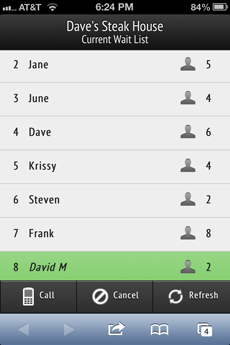 Seat By Text management reports include the time taken to seat guests, the number of guests and tables seated, and how many left without being seated. 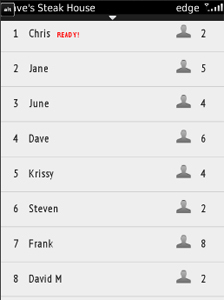 Track your trends by day, week, month, or year and know when your busiest times are. All of this makes it easier for managers to make decisions that will impact restaurant staffing, productivity, and profits. When using Seat by Text, there is no need for the restaurant or guests to download any apps. With very little set up cost, you can quickly begin managing the way you interact with your guests from the moment they arrive at your restaurant. Seat By Text is quite simply the easiest, most cost effective, and reliable way to ensure that your restaurant is performing as it should. Price and package informaion is currently being finalized. Contact Seat By Text for details on how to test the system free in your restaurant tonight. For general questions or sales inquiries, please submit the form below or call (813)701-2000.